In the last few months we’ve learned a lot about how social media, particularly Facebook, played a role in the 2016 election. But to truly understand how the media landscape is changing when it comes to political campaigns, it is important to also take into account the demise of television, and with it, the way that money in politics has been dominated by spending on television ads. Keep in mind that for years now, the majority of spending by both campaigns and super PACs has gone to ads aired on television. The total spent in 2016 surpassed the $1 billion mark. Meanwhile, a lot of people shrugged their shoulders when we heard that Russia spent only $100,000 on Facebook ads. We now know that the content of those ads reached 126 million voters. 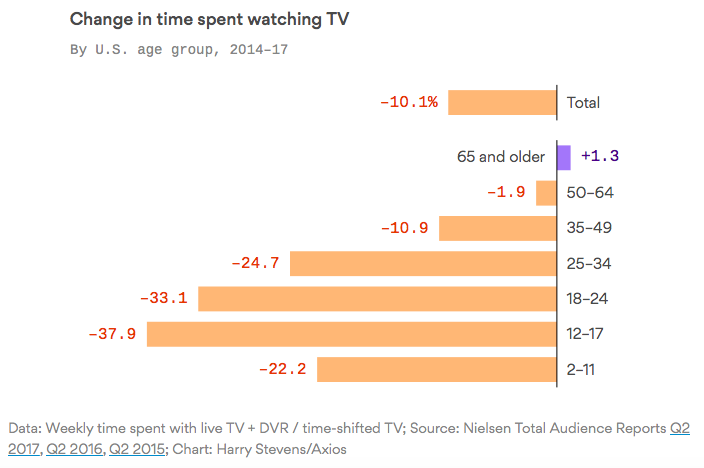 Sara Fischer has provided two charts that demonstrate the the slow but sure decline of television viewing. 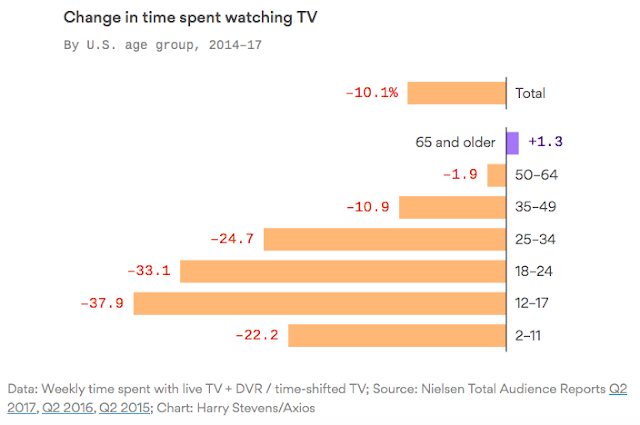 In the first one, note that, other than for 2-11 year-olds, there is a direct correlation between age and television viewing. The second shows the trends in various entertainment options over the last few years. 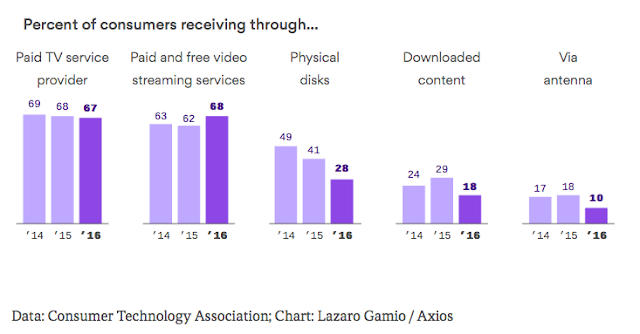 Streaming service subscribers are the only market that increased over the last three years and have now caught up with paid TV subscribers for the first time. While the changes from one year to the next look minimal, the age demographics will only accelerate the trends over time. As with every advancement, these changes offer the possibility of increased challenges as well as opportunities. We clearly saw how Facebook was used very cheaply by Russia as part of their effort to influence the 2016 election. But these trends also have the potential to undermine the role of big money in politics. It will be up to citizens and legislators to think through the changes that are necessary to capitalize on the opportunities and limit the dangers. Mark Zuckerberg Isn’t a Robot. That’s the Problem. Celebrity Heft Match: Do Democrats Really Need Their Own Trump?